A suicide bomber and extremists armed with assault rifles and explosives attacked a government building in the Afghan capital in an eight-hour siege. It ended when the three gunmen were killed. Health Ministry spokesman Wahid Majroh said Tuesday that 43 people were killed, including the attackers. No one immediately took responsibility for the attack. 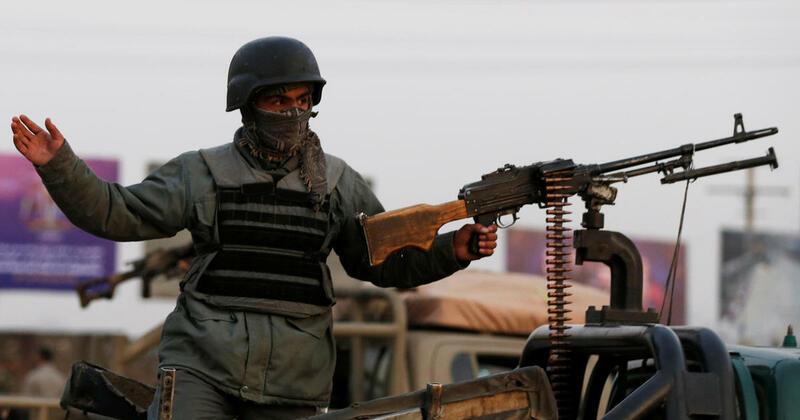 The Taliban and a local member of the Islamic State have made a relentless wave of attacks on government targets in recent years, but the Taliban denied involvement in the attack. The attack began when the suicide bomber detonated his explosive-laden car in front of a multi-story building housing a public welfare department in an eastern district of Kabul, Danish said. Minutes later, three armed men entered the building and raced through the office complex to search for victims. Some employees managed to barricade themselves in offices while the police quickly evacuated 357 people. Witnesses reported having heard at least five explosions when police and armed men acted on fire. One officer died and three were wounded. The Afghan security forces arrive on Monday, December 24, 2018, in an explosion and attack by armed men in Kabul, Afghanistan. The police blocked the area as they tried to secure the building, but Danish said the operation was cumbersome and slow as the officers moved cautiously from room to room and floor to floor. Kabul police spokesman Basir Mujahid said the authorities had received at least one message. A call from the building, but frightened employees could not provide any details. No one has taken responsibility, but both the Taliban and the local subsidiary of the Islamic State of Iraq and Syria (ISIS) have carried out three-day attacks in the capital. The building is located in an area where several residential buildings as well as the Afghan department are located public works. A witness reported that ambulances had raced to the scene during a shooting break, reports Reuters. The attack took place four days after US President Trump announced the withdrawal of half of the 14,000 American troops and just hours after Pakistani Foreign Minister Shah Mahmood Qureshi was in Kabul to hold a negotiated end to the war Afghan 17 year war. Qureshi, who continued his trip to Iran, condemned the attack. An Afghan policeman at the scene of the attack in Kabul, Afghanistan, on December 24, 2018. Pakistan orchestrated last week's peace talks in the United Arab Emirates, where representatives from Saudi Arabia, the United Arab Emirates, Pakistan and the US met with the Taliban. Taliban insurgents control nearly half of Afghanistan and are more powerful than Afghanistan at any time since a US-led invasion in 2001. They carry out attacks almost daily, targeting mainly security forces and government officials. The US and NATO officially ended their combat mission in 2014, but American and allied troops continue to strike against the Islamic State and Taliban groups and work to train and build the Afghan military.